Preheat oven to 200°C/390°F. Cut cauliflower into bite-sized pieces. Drain and rinse canned chickpeas. Peel and finely slice ginger and garlic. Finely slice scallion and set aside. Add cauliflower, chickpeas, olive oil, ground coriander, ground cumin, and ground cinnamon to a large bowl. Season with salt and pepper and toss to coat. Transfer to a large baking dish and roast at 200°C/390°F for approx. 25 min., or until the cauliflower is fork tender. Heat vegetable oil in a frying pan over medium-high heat. Add salmon fillet skin-side down and fry for approx. 3 min., or until the skin is crispy. Add sliced ginger and garlic, then flip the salmon, reduce heat to medium-low, and let the salmon fillet cook to desired level of doneness. Finely chop chili. Add yogurt, salt, pepper, ground turmeric, chili, orange juice, and lemon juice to a bowl and stir to combine. 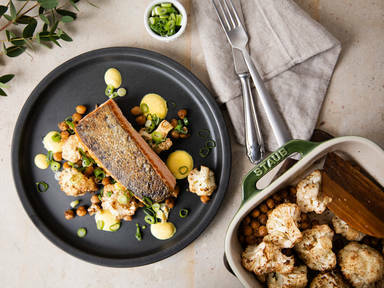 Serve roasted cauliflower and chickpeas with the salmon fillet on a plate. Drizzle with yogurt dressing and garnish with scallions. Enjoy!